The subjects discussed in the following pages, are, without doubt, the most deeply interesting that can engage the thoughts or feelings of men. Of the manner in which they are treated others must judge. To prevent disappointment, it may be remarked, that it was not so much the Author's intention to treat them practically, as to explain, establish, and vindicate them, as grand leading TRUTHS of the gospel of the Son of God, which are, unhappily, much misunderstood, neglected, and impugned in the present day. The writers, to whose labours he has been indebted for assistance, will be found referred to, and the extent of his obligations acknowledged, in the course of the work itself. He has often, since he commenced this undertaking, had occasion to regret the remoteness of his situation, at a distance from those stores of learning to which he might otherwise have had access, and from which he might have been enabled to enrich his pages. On the subject of Atonement, writers of the greatest eminence have, in every age, exerted their talents. The labours of Archbishop Magee, and of Dr J. Pye Smith, stand pre-eminent in modern times. The former writer has accumulated a body of proof for the reality of the atonement, which will serve to transmit to posterity his fame for biblical knowledge, acute thinking, and learned research. But, besides regretting that his varied materials had not been arranged in a more orderly and useful form, the friends of true religion have to lament that the opinions of this distinguished author, on some vital points, should have been not only defective but erroneous. These defects of the Archbishop have been supplied by the labours of Dr Smith, who, in his Four Discourses, has given a masterly view of what may be called the philosophy of the Atonement. There are other writers who treat, some of the necessity, and others of the extent, of the Atonement. But it appeared desirable that there should exist a work embracing a view of the whole subject; so comprehensive as not to fatigue the mind on any one topic, and yet so copious as not altogether to disappoint the serious and anxious inquirer, who should wish to obtain an adequate acquaintance with all the leading branches of this interesting and absorbing theme. To furnish such a work has been the aim of the present writer. He is not aware of the existence of any treatise on precisely the same plan. That of Dr Dewar, he believes, comes nearest to it. This opinion, however, is formed, simply from the title of the doctor's volume. As it appeared after the present undertaking was projected, the Author—whether wisely or not he pretends not to say—abstained from reading so much as a sentence of it, as he did not reckon its publication any good reason why he should abandon his purpose, and he was anxious not to embarrass his mind with any coincidences that might exist betwixt that writer's plan and his own. The subject is of sufficient magnitude and importance to warrant the employment of many minds. It is but a narrow and contracted view that could lead any one to suppose, on such a subject, that because some had already written upon it, others should refrain from directing the attention of the public to it again. No. The theme is one on which all the moral creatures of God may profitably exert their powers without interruption. The subject is indeed exhaustless—it is a theme for eternity! Every writer, too, has his own mode of treating a subject, and his own proper circle of readers, who will peruse with interest what he has written, while the superior productions of others on the same topic may never be known to exist. On the subject of the Intercession, the number of writers has been much more limited. It is, of course, introduced in works of systematic theology, as one of the functions of the Saviour's priesthood but it has seldom received a full and separate discussion. To be sure, it admits not of the same amplitude of remark as the other topic; but, in a practical and consolatory point of view, its interest is not exceeded even by the Atonement. The two are, however, inseparably connected; although we fear that, in this instance, men have not been always sufficiently aware of the evil of putting asunder what God has joined together. The treatise of Charnock on this point is the most complete that has come under the Author's notice. The present work was undertaken from the impulse of motives with which, perhaps, the reader is not greatly concerned. To supply what he conceived to be a desideratum in theological literature—to counteract the evils of prevalent erroneous sentiments—and to leave, in the district which has been the scene of his labours, some memorial of those official services which have been based on the principles of Atonement and Intercession, are among the inducements by which he was stimulated to enter upon, and to prosecute, this work. When it had been little more than begun, all progress was suspended for nearly a year, in consequence of bodily indisposition. And, even after it pleased God to give health to resume it, it has been carried forward only at such snatches of leisure as could be obtained, amid a considerable variety both of official avocation and domestic affliction. The writer cannot close without giving expression to the gratitude he feels to Him who has permitted him to complete a work on which he had set his heart. And he now commends it, with all due humility, to the blessing of that divine Intercessor, who can render the feeblest services of his people useful to men, and acceptable to God. SECTION II: OBJECTIONS TO ATONEMENT CONSIDERED. SECTION III: NECESSITY OF CHRIST'S ATONEMENT. SECTION IV: PROOF OF CHRIST'S ATONEMENT—ANCIENT SACRIFICES. SECTION VII: PROOF—THE SUFFERINGS OF CHRIST. SECTION VIII: PROOF—THE APOSTOLICAL WRITINGS. SECTION IX: MATTER OR SUBSTANCE OF CHRIST'S ATONEMENT. SECTION XII: RESULTS OF CHRIST'S ATONEMENT. 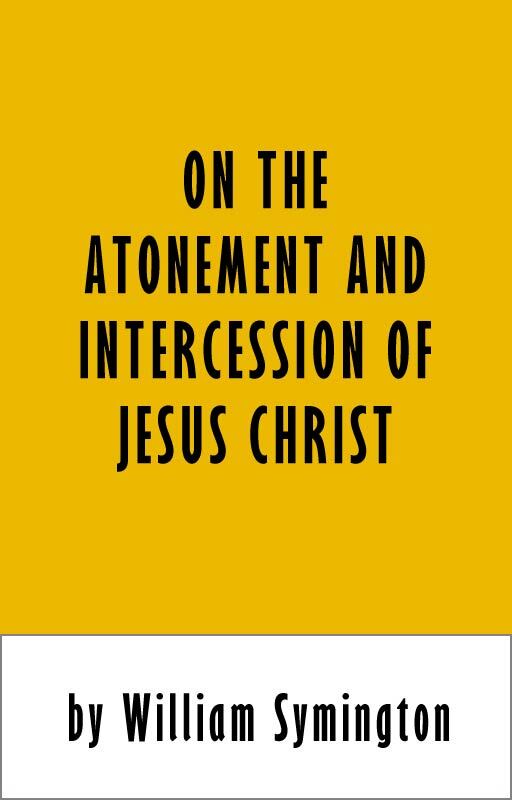 REALITY OF CHRIST'S INTERCESSION: SECTION II. NATURE OF CHRIST'S INTERCESSION" SECTION III. MATTER OF CHRISTS INTERCESSION: SECTION IV. PROPERTIES OF CHRISTS INTERCESSION: SECTION V.